Heat oven to 350°F. 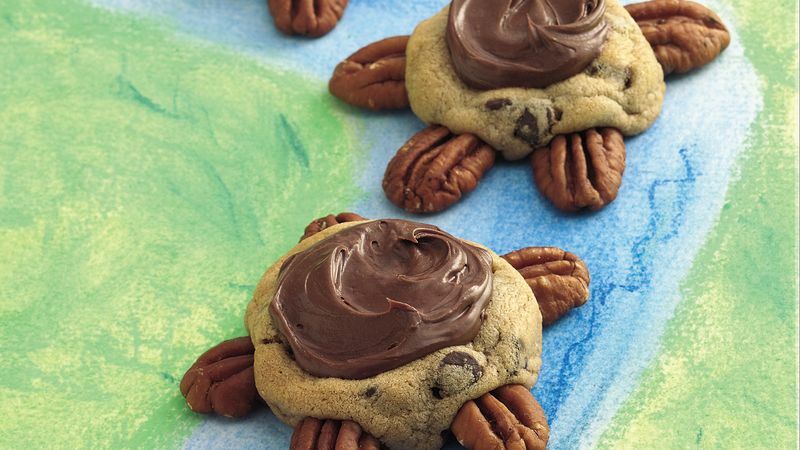 Arrange pecans in groups of 5 on ungreased cookie sheets to resemble head and legs of turtle. Bake 10 to 14 minutes or until golden brown. Immediately remove from cookie sheets to cooling racks. Cool completely, about 20 minutes. Spread about 1 rounded teaspoon frosting on each cooled cookie. You could use sugar cookie dough instead of the chocolate chip dough if you like. For the best results, keep pecans tightly covered. As they can spoil easily, store in the freezer for longer storage.